Banksy on Newman Street in London - word of mouth in action? It is interesting to see how word of this spread. 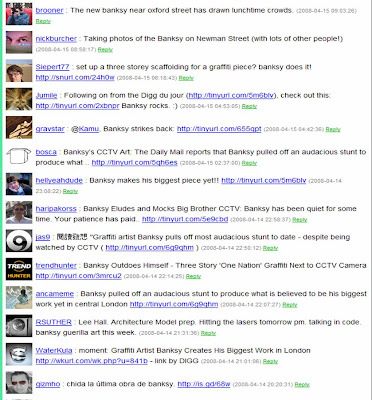 It was featured in newspapers this morning, but the Banksy Newman Street has also been a topic of conversation online - the Daily Mail report has had 4314 Diggs in 13 hours! I don't know how long this work will remain or for how much longer London councils will tolerate Banksy producing art like "One Nation Under CCTV", however as each new piece is created, it is intriguing how quickly word of it spreads and how many people are moved to go and look - is Banksy's work the ultimate word of mouth, viral marketing?